Let’s Communicate is everything you want in a human communication text—substantive, engaging, and fun. Created by communication scholars Douglas Fraleigh, Joseph Tuman, and Katherine Adams, Let’s Communicate takes their combined 100 years’ worth of research and teaching experience to present all the basic human communication concepts with unique attention paid to technology, culture, gender, and social justice. The authors provides provocative, real-life examples and a special focus on skills that together make communication meaningful for students both in and out of the classroom—all at an affordable price. 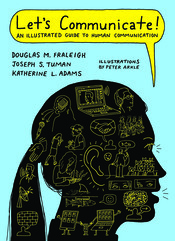 Let’s Communicate is also the first human communication text to use hundreds of hand-drawn illustrations that help students understand and retain important concepts. These unique and often humorous illustrations present concepts in graphic form (especially helpful for visual learners), make complex ideas easier to understand, provide hooks to help students remember material, extend concepts, and generate discussion.